The pig with the pink fairy wings and metallic pink hooves came. A disdainful llama came. 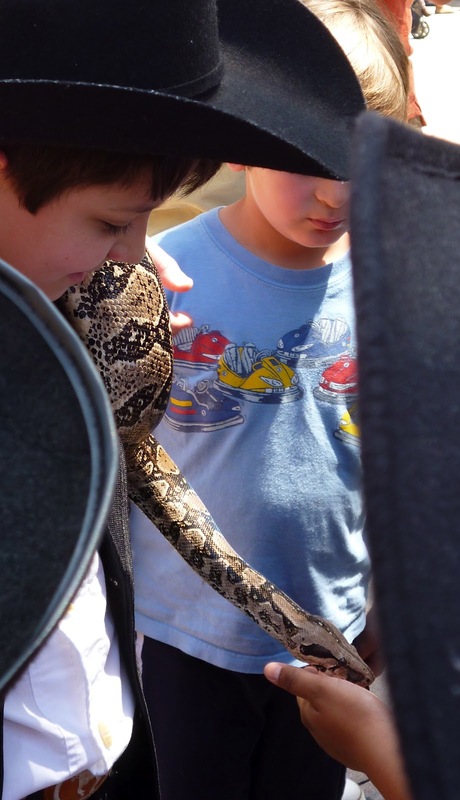 Three snakes were there . . . a bag full of rats . . . a turtle . . . an iguana . . . an army of chihuahuas . . . a terrified cat . . . several rabbits. And, of course, Archbishop Jose H. Gomez came with a barrel of holy water and well used, stiff bristled brush to rain blessings upon the animals and their caretakers. It was the Saturday before Easter and a glorious day for offering thanks and showing appreciation to the animals we love. 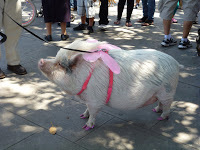 Saturday’s Blessing of the Animals on Olvera Street was the veritable overflow of Noah’s ark — a quintessential moments when Angelenos of all faiths, traditions, social classes and zip codes turn out to honor a tradition. Surrounding the stage at the center of the plaza were throngs of sightseers and pets. Buckets of water punctuated Olivera Street for the four-footed visitors. Children walked about with painted faces and bunny ears. Aztec dancers with shell anklets and dazzling costumes wandered through the crowds. Humane societies and pet adoption agencies had tables lining the plaza. 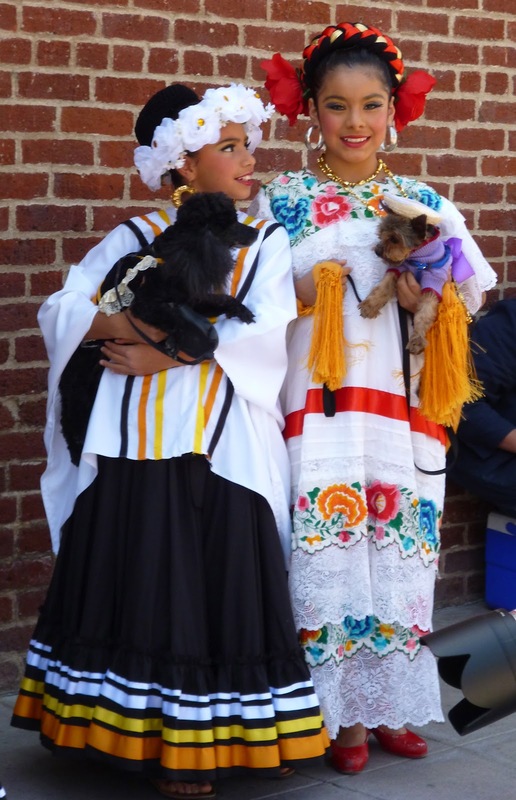 Folklorico dancers of all ages — some with pets in matching costumes — wandered about awaiting their time on stage. Down Olvera Street mariachis played. A mural at one end of the plaza portrayed the pageant about to unfold. Officially, the Blessing of the Animals event takes place from noon to 5 p.m. The procession and start of the blessing ceremony begins at 2 p.m. coming up Olvera Street, into the plaza and around to the stand where the Archbishop speaks and begins the blessings. People and pets wind back and forth in line awaiting their turn before the Archbishop. The process can take 45-minutes, if all goes smoothly. 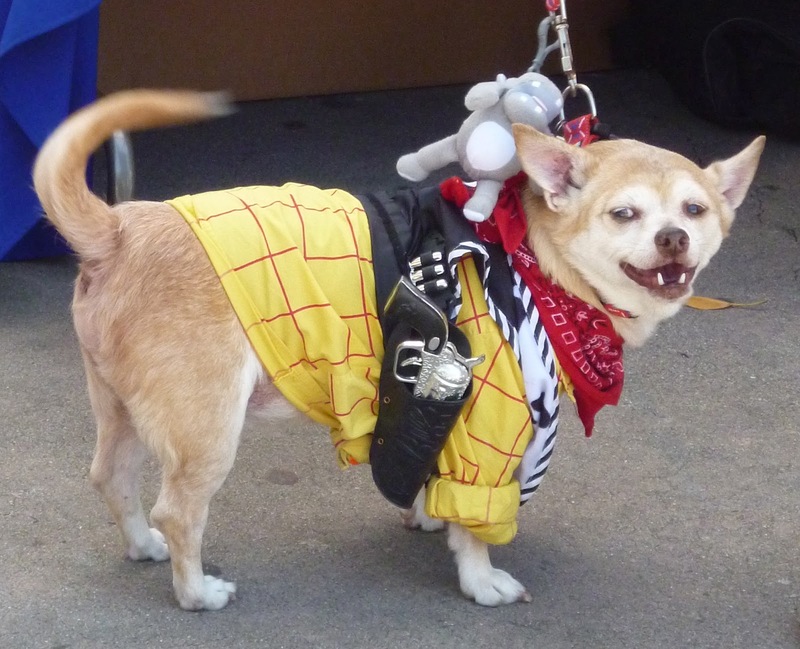 A ceremony to bless the animals has been held at Olvera Street since 1930. While some people attribute the ritual to St. Francis of Assisi, it may date back to the 4th century when San Antonio de Abad, the patron saint of the animal kingdom, acknowledged the contributions of beasts of burden to human kind. Regardless of its history, it is a human need that cuts across many cultures. Some Jewish congregations have a blessing of the animals during Passover to celebrate the freeing of the Hebrews and their animals from slavery in Egypt more than 3,000 years ago. It doesn’t take an Archbishop to bless your animals. And it shouldn’t wait for a once-a-year event. Animals bless our lives every day.